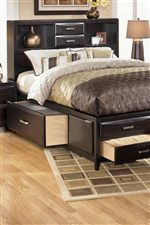 Maximize the storage in your master bedroom with this stylish contemporary bed with six storage drawers in the base and two drawers and two shelves in the bookcase headboard. The almost black look and bronze colored hardware create a sleek look. You'll find room for linens, clothing, shoes, and much more in this great storage bed. 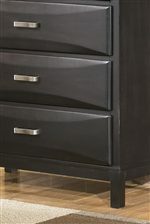 The Kira Queen Storage Bed by Ashley Furniture at AHFA in the area. Product availability may vary. Contact us for the most current availability on this product. B473-65 Queen Storage Headboard 1 65" 10" 57.38"
B473-64 Queen Storage Footboard 1 65" 2" 15"
Handles & Hardware Aged bronze colored hardware. Case Detail Straight block legs and clean lines maintain the contemporary style of the collection. Drawer / Shelf Construction Shaped overlay drawer fronts. Felt drawer bottom on select drawers. Case Construction Constructed from select hardwoods and veneers. With a dark finish and exciting contemporary design, the beauty and refreshing style of the Kira collection available for master bedroom and youth bedroom creates the perfect atmosphere for the bedroom of your dreams. The almost black finish flows dramatically over the slat style headboard and shaped overlay drawer fronts to enhance the straight lined contemporary design of this bedroom collection. With aged bronzed colored hardware complementing the dark finish and a stylish beveled mirror, this furniture is sure to enhance the look of any home's decor. Sleep within the rich contemporary style and comfort of the Kira bedroom collection. The Kira collection is a great option if you are looking for Contemporary furniture in the area. Browse other items in the Kira collection from AHFA in the area.